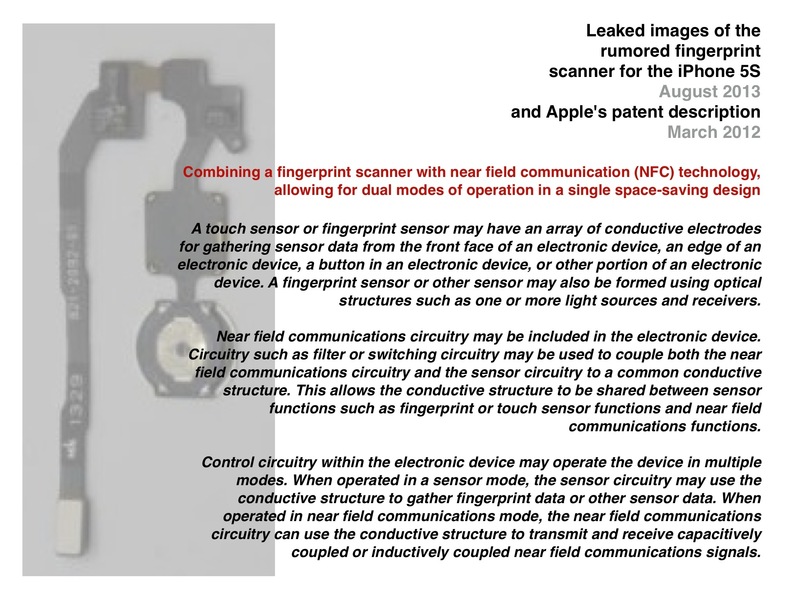 Many publishing media predicted that Apple would introduce the fingerprint scanner for it’s model iPhone 5S presented on Apple’s Keynote on September 10, 2013. Rumors were based on a patent application in 2012 and leaked images posted in publishing media around the world. A friction ridge is a raised portion of the epidermis on fingers consisting of one or more connected ridge units of friction ridge skin. These epidermal ridges serve to amplify vibrations triggered, for example, when fingertips brush across an uneven surface, better transmitting the signals to sensory nerves involved in fine texture perception. These ridges may also assist in gripping rough surfaces and may improve surface contact in wet conditions. The flexibility of friction ridge skin means that no two finger prints are ever exactly alike in every detail. Fingerprint identification, known as dactyloscopy is the process of comparing two impressions of friction ridge skin impressions from human fingers to determine whether these impressions could have come from the same individual. Since the early 20th century, fingerprint detection and analysis has been one of the most common and important forms of crime scene forensic investigation. More crimes have been solved with fingerprint evidence than for any other reason. The procedure for capturing a fingerprint using a sensor consists of rolling or touching with the finger onto a sensing area, which according to the physical principle in use (optical, ultrasonic, capacitive, or thermal) captures the difference between valleys and ridges. The electronic scan is the more modern way to take prints. When a finger touches or rolls onto a surface, the elastic skin deforms. The quantity and direction of the pressure applied by the user, the skin conditions and the projection of an irregular 3D object (the finger) onto a 2D flat plane introduce distortions, noise and inconsistencies in the captured fingerprint image. These problems result in inconsistent, irreproducible and non-uniform irregularities in the image. During each acquisition, therefore, the results of the imaging are different and uncontrollable. The representation of the same fingerprint changes every time the finger is placed on the sensor plate, increasing the complexity of any attempt to match fingerprints, impairing the system performance and consequently, limiting the widespread use of this biometric technology. In order to overcome these problems, as of 2010, non-contact or touchless 3D fingerprint scanners have been developed. Acquiring detailed 3D information, 3D fingerprint scanners take a digital approach to the analog process of pressing or rolling the finger. By modelling the distance between neighboring points, the fingerprint can be imaged at a resolution high enough to record all the necessary details. It’s done by sophisticated software which digitizes analogous information. In biometrics and forensic science, minutiae are major features of a fingerprint, using which comparisons of one print with another can be made. The ridge ending is the point at which a ridge terminates. Bifurcations are points at which a single ridge splits into two ridges. Short ridges (or dots) are ridges which are significantly shorter than the average ridge length on the fingerprint. Minutiae and patterns are very important in the analysis of fingerprints since no two fingers have been shown to be identical. Pattern based algorithms compare the basic fingerprint patterns (arch, whorl, and loop) between a previously stored template and a candidate fingerprint. This requires that the images be aligned in the same orientation. To do this, the algorithm finds a central point in the fingerprint image and centers on that. In a pattern-based algorithm, the template contains the type, size, and orientation of patterns within the aligned fingerprint image. The candidate fingerprint image is graphically compared with the template to determine the degree to which they match. Biometric identifiers are the distinctive, measurable characteristics used to label and describe individuals. They are often categorized as physiological versus behavioral characteristics. Physiological characteristics are related to the shape of the body. Examples include, but are not limited to fingerprint, face recognition, DNA, hand geometry, iris recognition, retina etc. Behavioral characteristics are related to the behavior of a person, including but not limited to: typing rhythm, gait, and voice. Some researchers have coined the term behaviometrics to describe the latter class of biometrics. Since biometric identifiers are unique to individuals, they are more reliable in verifying identity than token and knowledge-based methods. The following are used as performance metrics for biometric systems. It’s the probability that the system incorrectly matches the input pattern to a non-matching template in the database. It measures the percent of invalid inputs which are incorrectly accepted. In case of similarity scale, if the person is imposter in real, but the matching score is higher than the threshold, then he is treated as genuine that increase the FAR and hence performance also depends upon the selection of threshold value. It’s the probability that the system fails to detect a match between the input pattern and a matching template in the database. It measures the percent of valid inputs which are incorrectly rejected. The ROC plot is a visual characterization of the trade-off between the FAR and the FRR. In general, the matching algorithm performs a decision based on a threshold which determines how close to a template the input needs to be for it to be considered a match. If the threshold is reduced, there will be fewer false non-matches but more false accepts. Correspondingly, a higher threshold will reduce the FAR but increase the FRR. A common variation is the Detection error trade-off (DET), which is obtained using normal deviate scales on both axes. This more linear graph illuminates the differences for higher performances (rarer errors). It’s the rate at which both accept and reject errors are equal. The value of the EER can be easily obtained from the ROC curve. The EER is a quick way to compare the accuracy of devices with different ROC curves. In general, the device with the lowest EER is most accurate. It’s the rate at which attempts to create a template from an input is unsuccessful. This is most commonly caused by low quality inputs. Within automatic systems, the probability that the system fails to detect a biometric input when presented correctly. Are you ready to unlock your iOS device by using the fingerprint technology? Honestly said, I was not when I saw all the rumors and read all the articles about the reliability of this technology. That’s why I published a bet on Google+. Is it really a unique biometrical identifier? It might be but that’s not the first question which has to be answered. It’s the question whether the detection method and the underlying software keeps the assumed uniqueness under all conditions like temperature, degree of contamination, age, etc. No completely accurate method exists. Current methods only can tell us with a degree of certainty if two fingerprint images match. So it’s indispensable to offer an alternative access method which usually is a more old-fashioned but also more secure way to get access. Since 2011, Atrix smartphones from Motorola have included a fingerprint scanner in the power/lock button. But the devices also require users to set a recovery PIN, which highlights how enterprising attackers might simply attempt to crack that, instead of trying to fool with fingerprints. A fingerprint reader, could definitely make life more convenient by freeing users to not have to enter the four-digit passcode or a complex alphanumeric passphrase. That’s because entering a passcode or passphrase on a smartphone is a usability chore. Blame small screen size and the absence of tactile feedback, which make it all too easy to “fat-finger” a virtual keyboard, especially when entering long passphrases. Fingerprint scans, obviously, could eliminate the need to enter a complex password, arguably without compromising access security. One crucial related success factor, however, will be speed. If the average user employs a four-digit iPhone passcode and can enter it in less than a second, then the new biometric feature will need to be faster. Otherwise, the majority of users will stick with a faster option, which for many continues to involve no passcode at all. The solid state technology, younger than the optical one, has the undoubted advantage of allowing a greater miniaturization of the scanner, and this makes it more well-suited for the integration into small devices like smartphones and tablets. Manufacturing large and pure silicon chips is difficult and rather expensive; therefore, the solid state sensors nowadays available in the market are characterized by a small area. The silicon surface is in direct contact with the finger, or sometimes protected by a very thin coating, makes the solid state scanners rather weak with respect to mechanical damages or (in the case of capacitive sensor) to electrostatic charges. For a solid state scanner the cost of the sensing elements is dominant. The lifetime of a solid state scanner is usually shorter than optical’s. Solid state scanners need a more frequent cleaning, to remove from the sensor surface deposits of grease or dirt left from the fingers which highly deteriorate the quality of the acquired images. Apple purchased the company AuthenTec, Melbourne, Florida, in 2012. This company is specialized on fingerprint technology and so the essential know-how to use the technology in iOS devices was transferred to Apple. 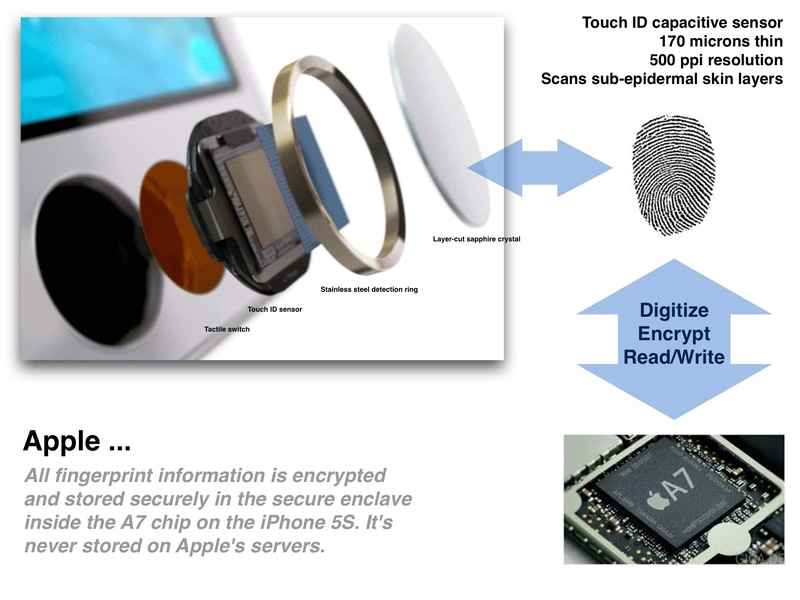 The U.S. Patent and Trademark Office on July 18, 2013, published one of the first AuthenTec patent applications assigned to Apple, with the property describing an advanced method of fingerprint identification that can be implemented into a mobile device. Apple is the first company to bring a well-functioning fingerprint sensor (Touch ID)) to a smartphone. Motorola Mobility implemented one such sensor into the back of its 2011 flagship the Motorola Atrix, which allowed users to swipe their fingers across it to unlock the device. The crucial issue though was that the sensor itself seemed awfully finicky and wouldn’t always correctly accept a user’s finger inputs. That little stumbling block ultimately meant that the fingerprint sensor wound up being more hassle than it was worth in most cases. The home button of the iPhone 5S is now made of sapphire glass to reduce the potential for damaging one of the 5S’ most notable features, and it’s bounded by a steel detection ring that determines when your finger is on the home button and fires up the Touch ID sensor. Touch ID is also capable of keeping tabs of multiple different fingerprints. This is quite useful if the device is e.g. used by family members. There stands a variety of ways to accomplish biometric fingerprint readings, including the stereotypical “swiping” motion made famous in movies, as well as methods using optical, thermal, pressure and capacitive measurements, among others. AuthenTec, which Apple purchased in 2012 for $356 million, uses a few different capture methods in its products, though the tech most likely to be used in the iPhone doesn’t involve swiping. Typical methods of swipe authentication, usually direct capacitance, involve a thin “strip” sensor that captures and stitches together multiple images of a fingerprint as a user sweeps their finger across the sensing plate. With direct capacitance, an electrical field is applied to the sensor, which detects ridges and valleys — the skin structures that form fingerprint whorls — by measuring variations in capacitance at the sensor plate. Lower capacitance denotes skin that is farther from the sensor, or valleys, while higher capacitance is associated with ridges. A more accurate and robust method of capture is called radio frequency field sensing, or AC capacitance. Like direct capacitive sensing, this technique also measures capacitance of a sort, but the similarities end there. Instead of measuring the effect on an electrical field, a low frequency RF signal is inserted into the finger and received by the sensor. In this case, RF signal strength captured by the pixel traces are measured and the corresponding data is translated to form an image of the print. Benefits of RF field/AC capacitance sensing include static non-swipe readings, resistance to dust and capability for the sensor to operate even when covered by layers of protective material. These types of sensors are usually larger in size to allow for a wider capture area. but you hit the nail right on the head. You are definitely an AppleInsider. We now have the fingerprint sensor in Apple’s iPhone 5S, the flagship of the company. The technology is quite complicated but the engineers of AuthenTec and Apple solved all the problems and Apple is rehabilitated as an innovative company. And it’s not only the fingerprint sensor that can be seen as a breakthrough but also the 64 Bit processor architecture, and, and, and. Regarding security everyone should know that the fingerprint is stored on the device only in a digitized format and does not go the way into iCloud when backing up a device. Authorities like “Nothing Secure Any longer” may knock on Apple’s door but the fingerprint remains a secret of the A7 processor. 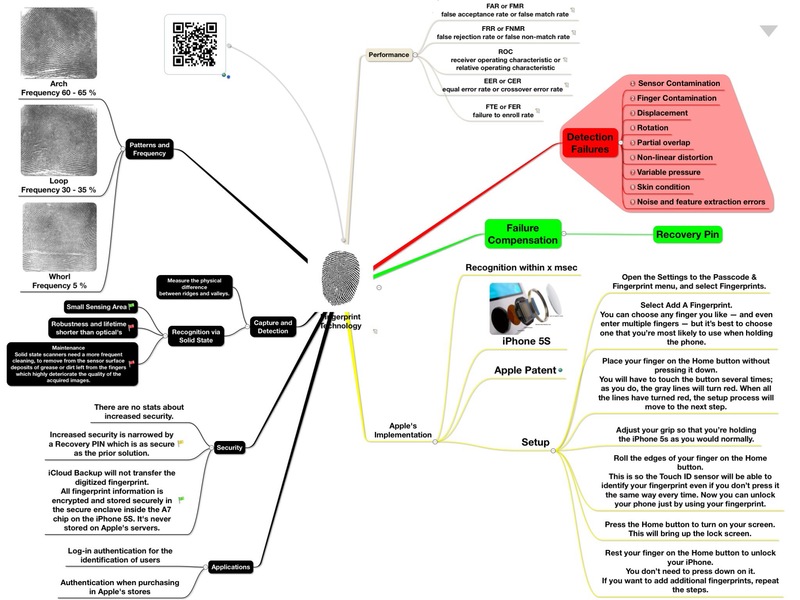 Feel free to download this map summarizing essential points from my Box account. The technology is quite complicated and we heard scientists saying the technology isn’t reliable. But Apple implemented it. Are Apple’s and AuthenTec’s technicians magicians? Well, I cannot assess this issue. But as a programmer I know that the software digitizing the scanner’s more or less precise information can be excellent or a bit more fault-tolerant. So the system works seamlessly but is not qualified to take a UNIQUE impression of the fingerprint. It just works (the companies slogan when introducing Mac OS X in 2007) if the number of measured points is low but it goes along with a decreased quality and it’s likely that uniqueness gets lost. If you visited my site with your mobile device, I promise not to abuse your fingerprint you left behind on my website when using your touchscreen.